One of the strongest contributors to the non-fiction narrative is profiled in British Documentary Movement, Vol. 3: Benjamin Britten. 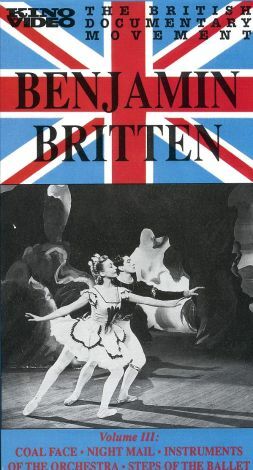 While Alberto Cavalcanti and Basil Wright were writing and directing the part-propaganda, part-artistic documentaries of the mid-'30s, Britten was providing the soundtrack. His goal was to make viewers more aware of the music in films while observing the similarities onscreen. Some of his work shown includes Night Mail and Coalface, both about the important coal industry of the British Isles. Instruments of the Orchestra and Steps of the Ballet are also remembered.